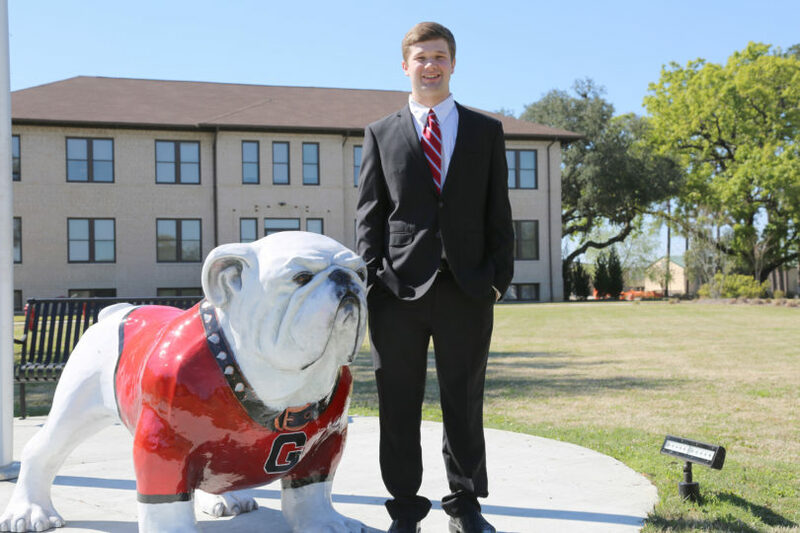 Ben Hancock, an agribusiness major at the UGA Tifton campus, will be attending the School of Law in the fall to become an attorney to provide him with opportunities to advocate for vulnerable children and better their lives. I have worked with Chick-fil-A for over three-and-a-half years and am currently employed as the hospitality director at Chick-fil-A Tifton. As an employee of this company, I have been blessed to receive the Remarkable Futures scholarship for the 2018-2019 and 2019-2020 academic years. My older brother earned his bachelor’s degree and is currently working on his master’s degree at the University of Georgia. The great opportunities and experiences he shared about the university solidified my decision to one day become a Bulldog. The University of Georgia has provided me with a great college experience and opportunities to develop as a leader. The professors and faculty of the university have worked tirelessly to invest in students like me and in effect have truly made a difference in my life. My time as a student at the College of Agricultural and Environmental Sciences has been filled with academic enhancement and development. The UGA Young Scholars Program was a phenomenal program that allowed me to strengthen my passion for agriculture. As a scholar in the Agricultural and Applied Economics program, I learned under brilliant UGA professors and conducted research with their guidance. Without this highlighted experience, I may not have discovered how much I respected agriculture which inspired me to major in agribusiness. In addition, the program instilled an admiration for the UGA Tifton campus as I participated in the program at that location. As a student at the University of Georgia Tifton Campus, I have been a member of the Agribusiness Club. As a student member, I have gotten to interact with fellow students who are passionate about agribusiness. In addition, I have been able to listen and ask questions to industry leaders who speak at our meetings. The Agribusiness Club has strengthened existing friendships and allowed me to create new ones. I have made the dean’s List multiple semesters at UGA. In addition, I have been blessed with several university-sponsored scholarships. As an agribusiness major, I have been blessed to receive the Wen Williams, Firor, Tate Brookins, and Burk scholarships. Receiving these scholarships made possible through the generosity of donors is truly an honor. Receiving the GE-Reagan Foundation scholarship has been the highest honor of my academic career. The program is funded and run by General Electric and the Ronald Reagan Foundation. The program provides $40,000 scholarships to students around the country. In addition to the financial support provided to students, the program invests in young people through leadership development and mentorships. As a GE-Reagan scholar, I have been blessed to attend a leadership retreat in Simi Valley, California, and a global retreat in Crotonville, New York. I would not be the person or student I am today without the great contributions received from the GE-Reagan foundation. The University of Georgia provides students with a top-notch education and experiences unlike any other. When I first visited UGA, I was blown away with the beautiful facilities and rich traditions. As a Georgia 4-H’er, I grew up admiring the support and work provided by UGA extension. In addition, as an agribusiness major, enrolling in the College of Agricultural and Environmental Sciences is a dream come true. I chose to attend the Tifton campus because it allowed me to stay closer to home while earning an esteemed education. In addition, I completed the UGA Young Scholars program at the UGA Tifton campus. During this program, I was introduced to the high-quality research conducted at the facilities. The professors, faculty and research scientists at the UGA Tifton campus are some of the brightest minds in the state. Choosing to be a University of Georgia student at the Tifton campus has been one of the highlights of my life. Choosing to attend UGA Law this upcoming fall was an easy choice. In fact, it was the only school I applied to as I chose the early decision application. The first time I walked in the Law Library I was filled with joy and a desire to attend UGA Law. As I toured the law school, several students in the J.D. program introduced themselves and told me about their experiences. Whether it be for undergraduate or graduate studies, I highly recommend prospective students to consider attending the University of Georgia. As a student at the Tifton campus, my experiences are unique. Administrative faculty member Skyler Folds oversees much of the activities at UGA Tifton and almost always has something fun planned for students. On Thursdays, it is popcorn day. Popcorn and drinks are provided and it is a great opportunity to interact with fellow students and faculty members. In addition, a Taco Tuesday dinner is consistently hosted on campus. In addition to these fun events, one of my favorite things to do on campus is playing ping-pong in-between classes. In the study lounge of the NESPAL building, there is a ping-pong table on campus. On many occasions, I take a break from studying and play a few games with fellow students and faculty. I enjoy spending time with my lovely wife and two children. Although I stay busy, I try to spend as much time with them as possible. Going to fun events and seeing new things with my spouse by my side is always a great way to spend time. In the fall, I took my wife to an Ed Sheeran concert for her birthday and we had a phenomenal time. I enjoy studying in the study lounge of the NESPAL building. The area has several computers, couches, and tables that provide the perfect environment for learning. If I am not studying on campus, my favorite place to review assignments and course work is at Taco Bell. Professor Amanda Smith and Dr. Greg Fonsah are the two most influential professors I’ve had the pleasure of studying under and learning from at the University of Georgia. I first met Dr. Fonsah when he served as my student mentor with the UGA Young Scholars Program in 2015. My area of focus was on agricultural and applied economics. Dr. Fonsah’s vast knowledge and experience of the subject was amazing and beneficial to me as a scholar. Under his leadership, I was able to conduct research on the potential level of demand for goat meat. A few years later, I was privileged to enroll in Dr. Fonsah’s “Selling in Agribusiness” class. The course was challenging and impactful to me as a student. At the end of the semester, students gave a business presentation to industry experts and faculty at the University of Georgia Tifton campus. I am grateful for Dr. Fonsah’s unique and abundant contributions to students like me. Professor Amanda Smith invests in her student’s future by challenging them to better their understanding of the business and agricultural industries. I was blessed to enroll in the course “Introduction to Agribusiness Management” taught by professor Smith. Whether it be by providing helpful feedback on assignments or answering questions after class, professor Smith sought to strengthen student’s understanding of agribusiness concepts. As a sports fan, I think it would be awesome to enjoy some time with Colin Cowherd of the Fox Sports network. Cowherd is a true professional and great commentator. His analogies are thought provoking and storytelling skills are second to none. The afternoon would fly by and be very enjoyable if I could share it with Cowherd. … campaign for public office. As a student who has benefited from the generosity of scholarship donors, I would want to start a scholarship fund that awards students based on merit and need. Paying for college can be difficult and I would want to help underprivileged, talented students achieve their academic aspirations. In the future, I want to give back to my community and help students have greater opportunities to attend college. Service to others is the key to a fulfilling life. I am passionate about using my energy and skills to better the lives of those around me. Becoming an attorney will provide me with great opportunities to advocate for vulnerable children and better their lives. In addition, I believe there will be great opportunities to improve the lives of a wide range of individuals in my role as an attorney. I will start law school shortly after I graduate with a B.S.A. in agribusiness. Law school will be a challenging and exciting endeavor. The academic growth spurred by the J.D. program is an exciting prospect that I look forward to starting and completing. Attending the spring 2017 UGA Commencement is an experience I will never forget. I remember being proud and remarkably happy for my older brother, Guy, as he received his diploma.